This dramatic feature was written, directed, and co-produced by Native Americans. The film was a winner of both the Audience Award and the Filmmakers' Trophy at the 1998 Sundance Film Festival. In 1976, an infant survives a fire that kills his parents. In a flash forward to the present day, the infant has grown up to become the skinny, nerdy adult Thomas (Evan Adams). 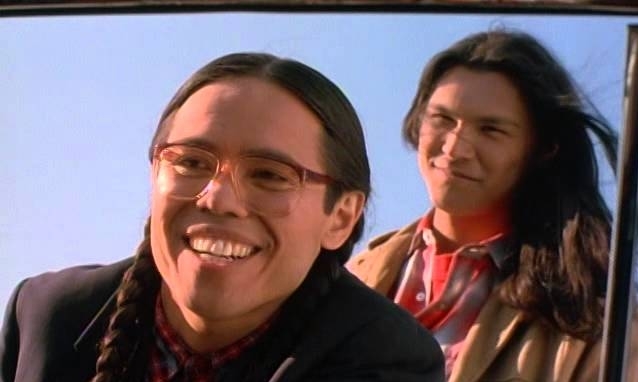 At Idaho's desolate Coeur d'Alene Indian reservation, the overeager youth is mostly ignored by others, including stoic athletic Victor Joseph (Adam Beach), even though it was Victor's father, Arnold Joseph (Gary Farmer), who saved the infant Thomas' life in the fire. Victor Joseph: You want to look like you just came back from catching a fish? This ain't Dances with Salmon, you know. Thomas, don't you even know how to be a real Indian? How many times have you seen Dances with Wolves? 100...200 times? (Thomas hangs his head in shame) Oh Jesus, Thomas, you have seen it that many times? Thomas Builds-the-Fire: You know, there are some children who really aren't children at all. They're just pillars of flame that burn everything they touch. And there are some children who are just pillars of ash that fall apart when you touch them. Victor and me, we were children of flame and ash. -Some days, it's a good day to die. And some days, it's a good day to have breakfast. -Geez Victor, I guess the warrior look doesn't work everytime. -All I know is that when your father left, your mother lost you too. -Velma: You guys got your passports? -Velma: Yeah, you're leavin' the rez and goin' into a whole different country, cousin. -Thomas Builds-the-Fire: But... but, it's the United States. -Lucy: Damn right it is! That's as foreign as it gets. Hope you two have your vaccinations. Responses to "Memorable Quotes from Smoke Signals, Famous Native American Movie"